The New Varieties talk was given by Dave Reid. There were 30 members present to hear which new varieties of Dahlias had caught Dave's eye during the year. In the photo above Dave is just about ready to start. 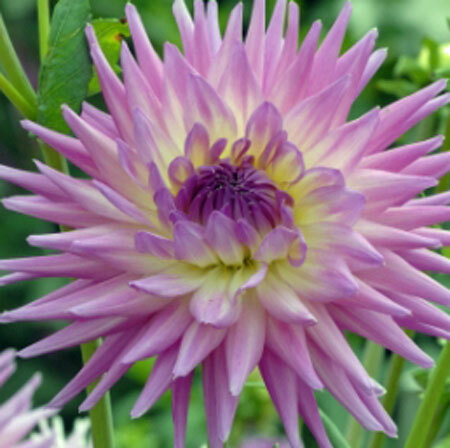 Dave described what he had seen both during his visit to New Zealand and the visit to Geerlings Dahlias in Holland. Rana Tauii was his favourite new Giant Dec. This was Citizen, seen at Geerlings. Dave's view is that this could be a serious alternative to Kenora Challenger. It grew well in the sandy soil in Holland, He is not sure how it will get on in UK soil. 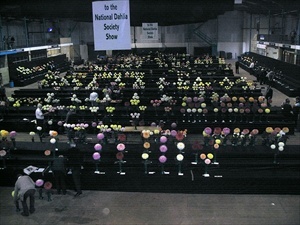 The NDS stand at the show had a bowl of Ruby on display. A guy turned up and said that he had bought a tuber of Ruby at the MDS tuber sale and it did not look anything like the blooms on show. It turned out that the tuber he bought was Tarahati Ruby! Weston Cream was, in Dave's opinion 'one of the best ever - a cracking miniature cactus'. enough said! I am a bit dubious about Dave's choice for this - Midlands 50. This a dahlia bred by Dave which he is dedicating to the MDS for it's 50th anniversary - thanks Dave.